Hello and welcome to Holistic Feet. My name is Lesley Cooke and I am a qualified reflexologist, foot health practitioner and complementary therapist. I am a full member of the Association of Reflexologists www.aor.org.uk and also a member of the Register of Foot Health Practitioners. I am fully insured and licenced with Ashfield District Council. I am also a member of Derbyshire County Council gold card scheme. I offer complementary therapy treatments in reflexology including maternity reflexology having trained with Suzanne Enzer and finger free reflexology ,aromatherapy massage, Indian head and neck massage, hot stone massage and Hopi ear candles. I also offer foot health care treatments. As a foot health practitioner, I am able to deal with the vast majority of everyday foot problems like cutting toenails,treating verruca and removing callus and corns while chiropodists and podiatrists also offer foot surgery. An important part of the treatment is assessment of the foot. If there are any problems that need further investigation, the client is referred to the relevant chiropody service for chiropody treatment. My practice is based in a hairdressing salon on Outram Street in Sutton in Ashfield, Nottinghamshire, which is a short walk from Sutton town centre. It is easily accessible from Mansfield, Kirkby-In-Ashfield and surrounding areas. Junction 28 of the M1 which is the South Normanton and Derbyshire exit and the A38 are also close by map. For those of you who use a sat nav, the postcode is NG17 4FS. My opening hours are: Thursday 9am-5pm, Friday 9am-7pm and Saturday 8am-4pm. From April 2018, I am able to offer mobile appointments on Monday and Tuesday for foot health treatments and reflexology. If you are experiencing conditions such as muscular aches and pains or feeling tired all the time then complementary therapy may help or if you just need a foot treatment, then please feel free to contact me, as I may very well be able to help. I am constantly updating my skills by taking courses in other complementary therapies in order to offer a wide range of treatments. I always encourage people to try not to think of treatments as pampering sessions. It is far more than that - it could be the way to maintain your own health in a totally natural way. 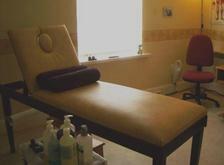 If you would like to ask about any of the treatments or make an appointment, please ring me any time on 07790 820513. If the call goes to voicemail, please leave a message and I will ring you back as soon as possible. I look forward to seeing you.